When you pass by you will sometimes notice a small lineup outside and if there isn’t one outside, there is already one inside. The lineup is not a long or slow one so you can count on being seated in about 10-15 minutes and if you don’t mind you can sit at the bar as well and trim that time down. Since many people don’t feel like eating at the bar, it’s almost always available. The inside is quite large and looks very nice and modern yet still has that warmth and comfort that makes for a nice venue. The menu does a good job of combining ample selection with fair prices. 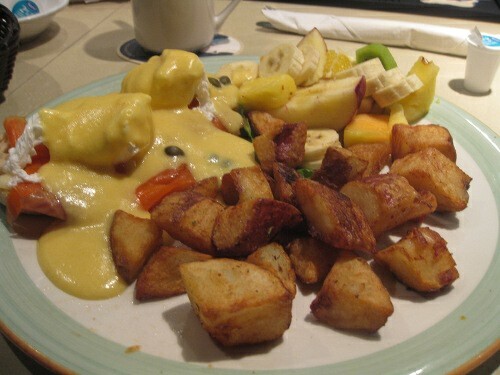 Most items are priced in the $10 range and you can find lots of selection ranging from 15 omelettes ($5.95-$10.95); 6 eggs benedict ($9.00-$10.95); 10 crepes ($6.00-$8.95); 5 french toast ($6.95-$9.50); waffles ($6.95-$9.50); 10 combo plates ($8-$10); a kids menu with 5 items ($2.95-$3.95). They also have an early bird section with 6 items including things like fruit cups, French toast, crepes all under $6.00. Another thing to note is that they have a Dejeuner Universel section with a bunch of different items all in one (pancakes, French toast, eggs…) priced around $11.95. 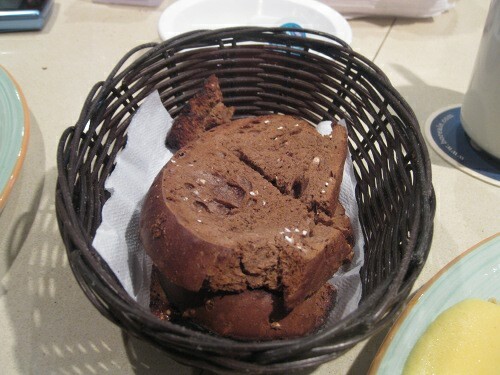 My friend ordered the mushroom omelette ($7.50) plate which came with a choice of bread in which she chose sour dough bread. The omelette definitely had a nice pronounced mushroom taste. I felt it was lacking a touch in the cheese and eggyness department but the potatoes it came with were very good and the fruit on the side was fair. A more varied and plentiful fruit selection would have made the dish better. I ordered the Salmon Eggs Benedict ($11.95) where the eggs were nicely poached and there was a generous amount of Hollandaise sauce. The smoked salmon portion was plentiful and the side of fruit was much more varied than the omelette plate. This dish also came with a side of potatoes which were quite good and coffee was included (it was not for the other dish). As eggs Benedicts go, it was slightly above average; it was not the best I had but it did a good job of filling my stomach and making me happy. Our waitress was very nice she was helpful in suggesting some of the more famous options and explaining them in detail. I was actually torn not knowing what to order but she helped me out considerably. There was an initial issue at the beginning when it took a little longer than I would have like to get my coffee but after that it was resolved by lightning fast refills. I actually think she flat out forgot at the beginning and then kept trying to be on top of it because she felt bad. 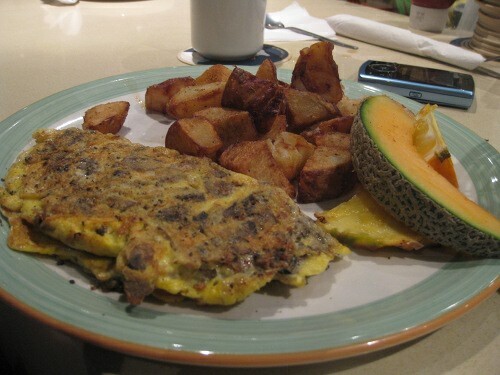 The omelette section offers lots of vegetarian options as well as the eggs section. In fact, most sections are not meat focused. If you are vegetarian you can find some decent choice items here and they also have a yogourt section for those who want a healthier options. As for vegan options – sorry no luck here. 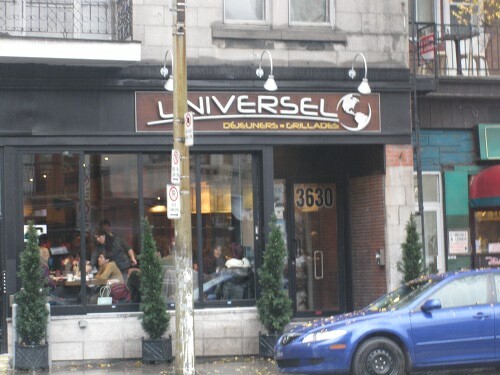 Overall the main strengths at Universel are the varied menu, decent sized portions and fair prices. The décor is nice, although the music was a little loud. The fact that it is open 7 days a week is pretty great and the bonus of quickly moving lineup helps a lot. The down side on this place is that it’s a touch noisy and the dishes, although varied and generous, are not out of this world, which is something I think they can improve on and take this place to the next level of brunch greatness. When I see this place, I see a place that can be like L’avenue; it’s just that they need to experiment with the menu and take some creative risks.